Is the Ariens Deluxe 30 Model 921032 snow blower right for you? The new Ariens Auto-Turn takes the large, high capacity Ariens 921032 Deluxe 30 snow blower and makes it easy to use. The new Deluxe 30 has features that make it better than most of the other snow blowers in this size. Two-Belt impeller drive, cast iron gearbox and the new Auto-Turn steering. The 2013 model does not have Auto-Turn. I gave the Craftsman 88396 snow blower my “best value” rating for 30 inch snow blowers for 2014 but this snow blower is my second choice. The combination of features, durability and service and parts availability also makes this one of the best snow blowers on the market. As a homeowner with a large driveway this is a great choice. Ariens has taken one of the best homeowner snow blowers on the market and made it better – without raising the price! Auto-Turn eliminates the need for you to make large loops during a turn, instead allowing even, tight turns from the center axis of the machine. This new technology will actually zero-turn. It also eliminates having to hang on to both handles and pull levers to make the turn. Their are no levers to move to make a turn so turning becomes a simple, natural gesture while still giving the traction you need in the snow. You can turn effortlessly without adjusting the speed. This snow blower is sized for most 2-3 car suburban driveways. It handles 4 to 16 inch snows easily and has enough power to blow heavy, wet snow. The intake is tall enough to handle 20 inch drifts. It works well on gravel driveways. Auto-Turn is designed to let operators avoid straining and pulling in a turn, and allows them to guide the snow blower precisely without adjusting speed. No manual adjustments are needed to enable the feature. The steering feature is also available on Ariens Deluxe 30 wheel-drive models and all models in the Ariens Platinum, Professional, and Hydro-Pro including track-drive. Ariens offers eight different grades of snow blowers. 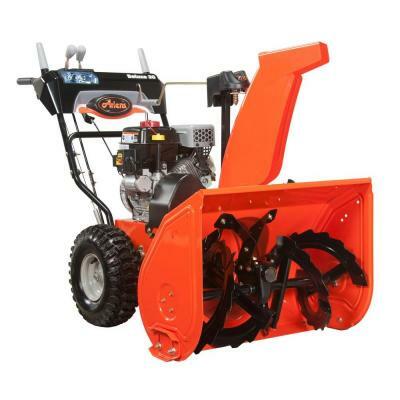 Ariens is a primary snow thrower manufacture and offers snow blowers for all homeowners, businesses and commercial users. The Deluxe is the full-featured heavy duty residential line. The Deluxe 30 reviewed here is a reasonably priced unit that easily gets the job done year after year. Ariens currently does not make snow throwers for other brands that I am aware of. What makes this snow blower the best 30 inch snow thrower for you? 291 cc Ariens AX engine. This engine by LCT delivers over 14.5 ft lbs of torque. Dual roller ball bearings reduce friction and prolong life. Commercial cast iron sleeve reduces wear and improves emissions. Over 2 hours run time per tank of gas make’s it very fuel efficient. 14 in. 3-blade impeller. The 14 inch blower is larger than any other snow blower in this price range. This is one of three reasons this Ariens will blow snow over 50 feet. Other features you are used to. While the Auto-Turn is new, the Deluxe 30 snow blower has been around for a while. It is a proven, high capacity snow blower. Less than 1 % of the reviews are negative. Of the 280 reviews only 3 are from mechanical problems and those seem to be bad assembly from the factory. The other negative reviews are from maneuverability and those have been addressed with the new Auto-Turn Steering. It’s well made and owners like it! Ariens AX engine, headlight and metal chute with remote controls give it the features many of you demand. These features plus the standard features you find on a Ariens make it one of the best snow blowers. The Ariens 28 Deluxe may just be the new standard in large, homeowner snow blowers. Value: At $1299 it is a good value. 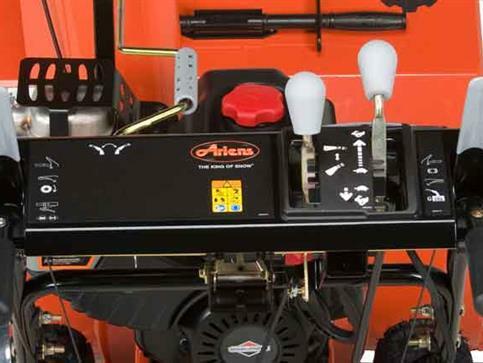 Service & Parts Availability: Service and parts are readily available through Ariens authorized repair centers. Home Depot is easy to work with if you have a problem. All Snow Blowers need maintenance. When you get your new snow blower home be sure to read the manual, check all the fluid levels and bolts. Learn how to change the shear pins and inspect the drive belts. (The belts are easy to change if you tear one up) ALWAYS have extra shear pins on hand. Learn how to start it and operate it. Snow blower engines run differently than your lawn mower engine. Most of the time you will have the choke on to some degree. (That’s why there are 4 positions on the choke) Practice using it on you driveway. (Don’t run the engine more than 10 minutes if the temperature is over 45 degrees) If you have any questions leave a comment below and we (other readers and myself) will gladly answer your questions. Above all PLEASE use a fuel stabilizer like Sea Foam or blue Stabil in your gas. You can add an electric shute control on the Ariens. Check Jacks Small Engines accessories for Ariens. Hi Larry, The part you see there is just for the replacement motor on a 2000-2003 Ariens. There is no electric conversion kit from Ariens for todays machines.